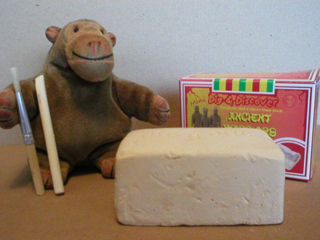 On a visit to the Chinese Arts Centre in Manchester, Mr Monkey acquired a small box which promised him that he could dig and discover and excavate and collect his own ancient warrior from the tomb of the Chinese Emperor Qin Shi Huangdi. A while later he decided to do a little excavating. 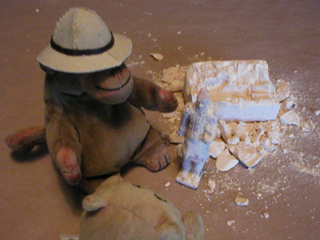 Mr Monkey opened the box, undid some plastic wrapping and found that he had a block which should be concealing a terracotta warrior and the tools to excavate with. He wasn't completely convinced that real archaeologists only needed a brush and a pointed stick, so he decided to equip himself 'properly'. 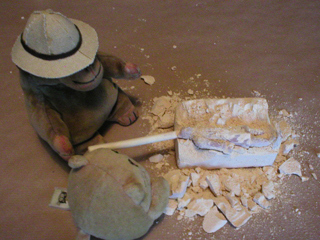 Having seen The Mummy Mr Monkey knew that real archaeologists always put on a solar topee before digging anything up, so he got his out of his hat box. 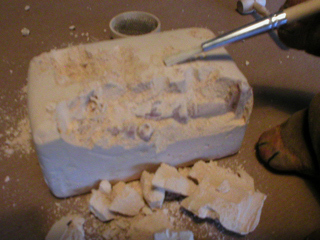 He decided that a hammer and chisel would be better than the pointy stick for uncovering the artifact,and also brought along a sieve thing in case anything needed sieving. 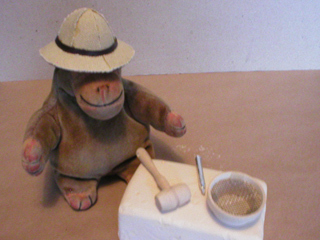 Mr Monkey picked up his hammer and chisel and decided where to start chipping first. 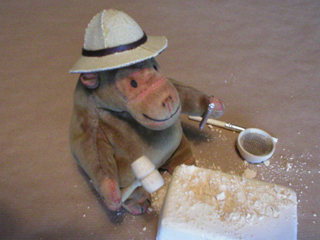 After several minutes, Mr Monkey had managed to turn most of the top of the block into small bits of plastery sand. 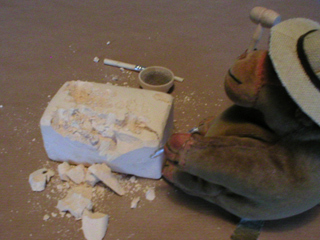 After a while, Mr Monkey decided a better approach would be to chip away at the side of the block. This turned out to be a very good idea, as he was able to knock bigger chuncks off the block. In a very careful archaelogist sort of way, of course. Soon Mr Monkey noticed something in the block that wasn't the block itself. 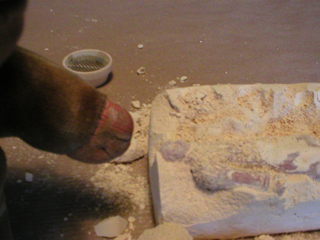 He carefully brushed away the little bits of sand and plaster, and realised that he'd found one of the legs of the buried warrior. Mr Monkey chipped and brushed carefully at the other end of the block and soon exposed the warrior's head as well as his feet. 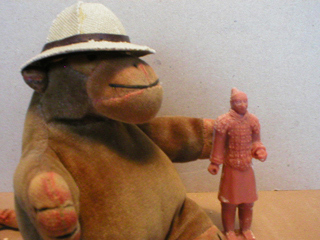 Mr Monkey called on his faithful assistant, Mr Cat, and they found out that the pointy stick was actually quite a useful tool to lever the terracotta warrior out of the block. It's entirely possibly that this isn't proper procedure, but Mr Monkey's archaeological techniques are based on watching old movies and may not be completely up to date. Mr Monkey and Mr Cat stood the warrior up, and admired their find. It was a bit dusty, so they made Mr Rik wash off the last bits of plaster and sand. Studying the cleaned up statue, Mr Monkey had the vague feeling that the terracotta warrior was a little smaller and considerably less made of terracotta than he'd expected it to be. Mr Monkey decided it would be a very good idea to go and see the First Emperor exhibition at the British Museum to see what a member of the terracotta army should look like.